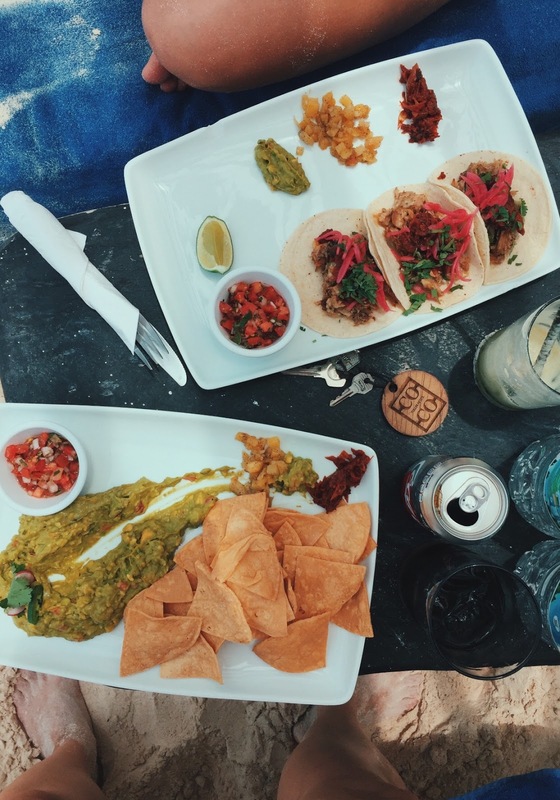 Let me start by saying that there is no wrong place to eat in Tulum. As far as we know. You're going to search the web and see 20 restaurants that different people say you have to go to. And there are even more than that to explore. But our highest recommendation goes to Hartwood. You will read all different kinds of reviews on this restaurant, but there is no denying that the food could make you cry, it's that good. I had an empanada appetizer that I'm still dreaming about. I'm not going to lie. We didn't have the greatest service we've ever had. Our server was never rude but he was disinterested at best. Casey and her mom ate here last year and they had outstanding service + food. Honestly, the food is so good that unless your server spits in your face, you can't even care. Here is that life changing empanada and a jicama salad. The menu changes daily, but there is always a meat option, tons of seafood options and plenty of vegetarian options. Your server will explain each thing on the menu for you, so don't be afraid to ask questions. Also, don't skip out on dessert! We all shared a coconut cake and Casey got their house made coconut and corn ice creams. We ate here at El Pez 4 times. Yes you read that right. FOUR times. 3 times for breakfast and 1 time for dinner. El Pez was obviously worthy of eating at multiple times, but we do regret eating breakfast there so many times because there are so many amazing options. However, after we ate there the first time, the location + the setting + the service were so exceptional we made this our go-to breakfast spot. The food is excellent as well (get the omelette of avocado toast) but this place is the total package. A big bonus was they do free refills on coffee :) Most places charge by the cup. We loved the decor at El Pez so much we wanted to move in! Also, their tableware was so dreamy. Casey asked where she could buy the pieces and apparently they get asked that a lot. Unfortunately they got them somewhere in Europe (I think that's what they said) so we weren't going to be getting our hands on them while on this trip. Juanita Diavola is located right next to Coco Tulum and is part of the hotel. We ate here for breakfast once and dinner once. Casey had chia seed pudding that was life-altering. As soon as we got home she started making chia pudding. This one was made with mango so it wasn't milky like a lot of chia puddings are. They also make oven fired pizzas that are massive and delicious. It was great to be able to walk 10 seconds out our door to the restaurant. A good thing to keep in mind- all restaurants in Tulum are open-air, but it's amazing. You can't beat the ambiance that the jungle and ocean naturally create. The night we ate at Juanita Diavola was the only night it rained and we had to take cover at the end of dinner. By the way, that is not a complaint at all, it's just part of the experience! The Real Coconut is healthy food lovers' dream. The entire restaurant is gluten free which is perfect for Casey since she can't eat gluten. The make their own coconut tortillas and tortilla chips and now you can buy them at Whole Foods! The whole time while we were in Mexico Casey kept saying she wanted pancakes (gluten-free) and on our last day she got her wish. This was the only place that we found that had them! I had eggs and crispy coconut tortillas, with avocado and tomato sauce, but can't remember what it was called. The tortillas were great if you are looking for an alternative to wheat, rice and corn. The Real Coconut is located in the Sanara Hotel and it's right on the beach, so the view was exceptional. It was the perfect place to eat just hours before we had to board our plane. Raw Love Tulum is a cool little vibey place that is in the jungle, but also right on the beach. It's near and/or apart of Ahua Tulum. There are hammocks everywhere and it's a great place to hang and get a juice or a vegan treat. We had some coconut carrot bites that were delicious! Actually, I can't remember exactly what it was we had, but they were sooooo good. Definitely get one of their desserts. La Zebra was delightful. They have a beach club that we went to one day. They had a pop-up bar from NYC there while we were there, but I think it ended in May. We had a pina colada and we each had a fancy custom drink, both were great. Nothing beats sipping a great cocktail while on a beach bed staring at the ocean. La Zebra also had exceptional service. Ki-Bok is a coffee shop in town. You can sit in the garden area to order and eat breakfast or you can just order a latte at the counter. The food was good, but the little garden stole the show. It was intimate and cute and full of all our favorite plants. This place was a block away from our Airbnb and is really in the center of everything in town. Even though there are so many great restaurants on the beach strip, eating in town is way more affordable and you just can't go wrong. You definitely don't want to skip this part. There are plenty of restaurants to choose from, and if you just want to grab some street tacos, they are cheap and completely delicious. We had some $4 giant mojitos somewhere that were perfect. This is a normal drink price in town. 1.Guacamole. I think we ate guacamole almost every day. It's so fresh and amazing. 2. Paletas. We both got coconut and again, these were so fresh. These are definitely not as sweet as in the states, as we found true of most desserts. But that makes them even better! 3. Coco Frio! AKA a cold coconut with a straw. Yummy and cheap. 4. And lastly, elote or street corn- eat it where ever you find it. The corn that we had was so good and the texture of the corn was way different than any corn I've ever eaten. The corn was more dense and chewy. So delicious! I mean I would've eaten this everyday if we were near it. I had chile on mine and it was pretty spicy (and I like spice) and Casey had no spice. Again, I can't stress how different the corn was enough. It's kind of mind boggling, but you have to get some! If you liked this post and would love to see more like it, please pin the image below! P.S. 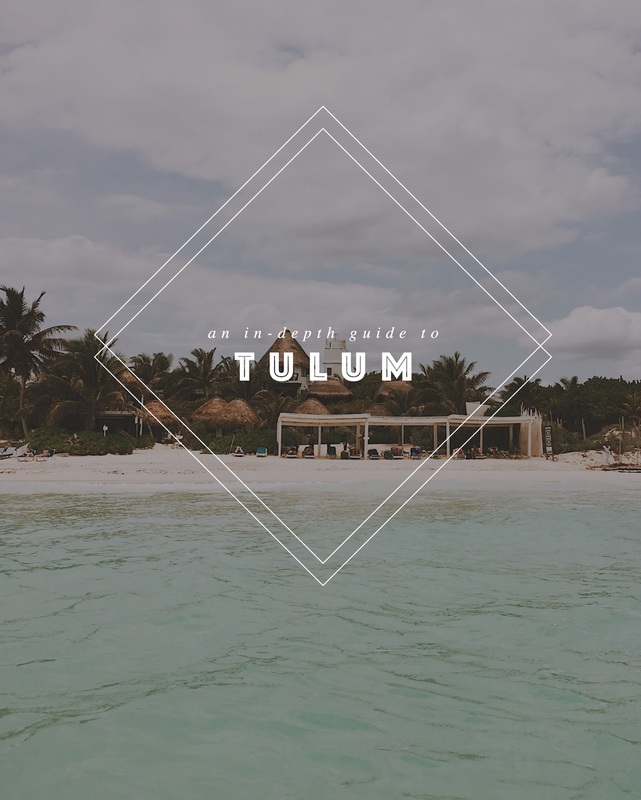 Well we are 3/4 of the way done with the Guide to Tulum series! Next week we will be talking about what to do while in Tulum. This is an amazing guide! I just recently went to Mexico City and had a great time, but I'd love to visit Tulum.